Fred Ames was accepted at Harvard! He shared the good news with his relatives when he returned to North Easton this evening. He did well on his examination, which perhaps constituted some combination of interview and oral or written test of the depth of his knowledge. How proud his parents must have been, and what relief he must have felt to have the entrance hurdle behind him. Fred’s life was now moving in a fresh direction but otherwise, things in North Easton were much the same as he had left them the day before. Under a hot and humid sky, Evelina was sewing and looking after her mother, Hannah Lothrop Gilmore, who wasn’t feeling well. Fred’s parents, Oliver Jr. and Sarah Lothrop Ames, meanwhile, had driven off to fetch his sister, Helen, from school in Dorchester. Today’s sewing project was a chemisette for Evelina’s newest dress, the silk muslin that she and dressmaker Julia Mahoney had been working on this week. 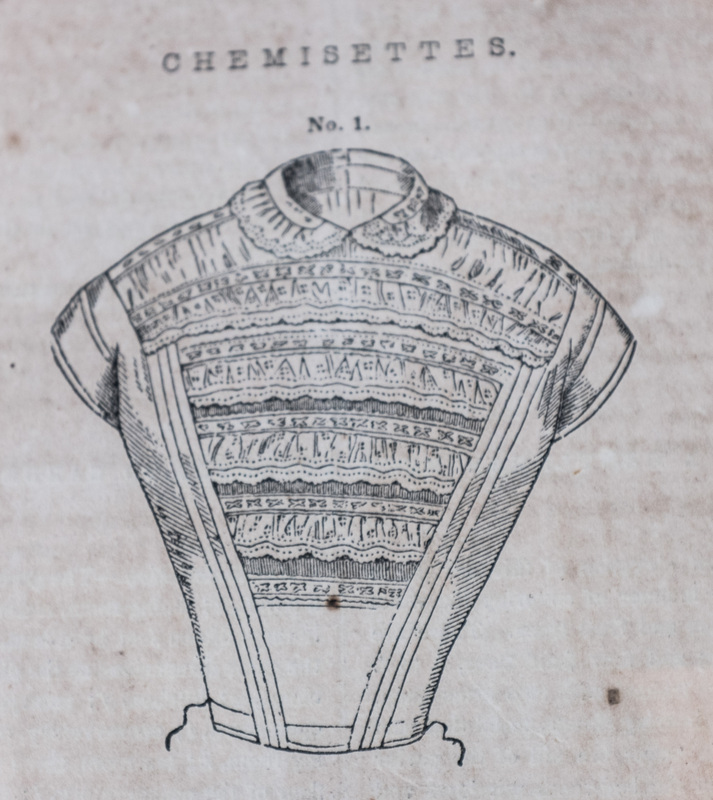 The chemisette was a light blouse designed to be worn under the jacket bodice of the dress. Hers probably wasn’t as elaborate as the chemisette in the illustration. Ah,accomplishment which is more than I can say for my days!